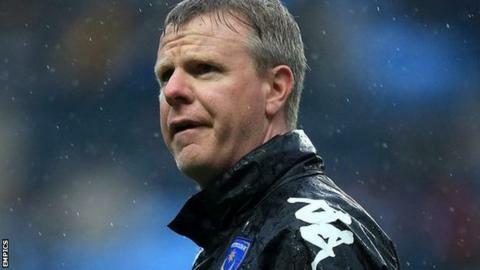 Portsmouth have appointed Andy Awford as their full-time manager after a successful spell as caretaker boss. The 41-year-old met with the board on Thursday last week and has now agreed a one-year rolling contract to take over. Ex-academy boss Awford replaced Richie Barker on 27 March and won five out of six games, with the other drawn, to steer Pompey to League Two safety. "It is with huge pride that I am delighted to accept the board's offer to be the new manager," said Awford. He had previously taken charge as caretaker when Guy Whittingham was sacked in November 2013. Awford, a former defender at Pompey, was also once the youngest ever player in the FA Cup, at just 15 years and 88 days old, while at Worcester City. He made over 300 appearances for Portsmouth and has held several roles at Fratton Park, including chief scout and reserve-team manager. "After the Pompey board failed to get it right with the appointment of Richie Barker, their decision this time around has been made easy by Andy Awford's success. He's shown in two caretaker spells that he can have an impact on the team, and can turn the dressing room around. He also cares about the club as much as anyone, so his stewardship will always be about what's best for the club, and that has to be important to the board. "Pompey supporters will be delighted to have one of their own in charge, especially at a time when the Supporters Trust are at the helm of the club. Awford is a one-club man, whose passion for Pompey is evident and obvious. The only reservation supporters have is that , like Guy Whittingham before him, a parting of ways down the road could lead to another club man being on the outside. "His priorities are four-fold; to put his coaching team together, to put his successor in place at the club's academy, to set up a successful scouting network for the first team and the academy, and to put his squad together for the start of pre-season." He will become their third full-time manager in the past six months. "I have accepted the offer as I feel the club is, after a year of laying strong financial foundations, now in a position to look ahead, move forward, go from strength to strength and achieve the stability it craves," he added. "I genuinely believe that the club is now ready to progress and the opportunity to lead it is a challenge that I relish and am absolutely committed to. "The rebuild won't be quick and simple, as unfortunately we are still hindered by the recent past, but the board have assured me that brick-by-brick, day-by-day, month-by-month, year-by-year, we will continue the good work that has been done this season and build a football club that we can all be very proud of for years to come." Awford added that he was "honoured, excited and thrilled" to be named Pompey manager and urged everyone at the supporter-owned club to stick together to help win promotion from League Two next season. "In my opinion, the only way we can achieve this is by all of us - the board, the staff, the players, the fans, the city - being united and maintaining the 'Pompey Spirit' that I know is unbreakable," he said. "The city must smile and when Pompey is happy this city most definitely smiles. "The opportunity to manage this football club is one I am extremely grateful for and it allows me to achieve another personal football ambition."